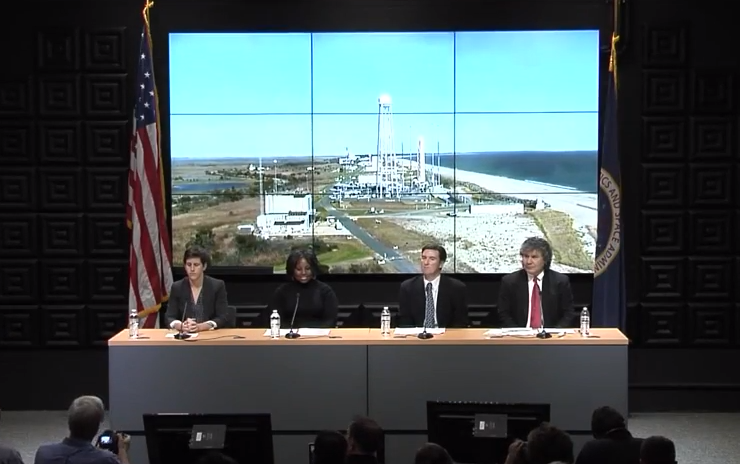 On October 26, 2014, at NASA’s Wallops Flight Facility, Wallops Island, VA, NASA conducted a Pre-Flight Science Briefing for the ill-fated Orb-3 launch, which was to carry the Student Spaceflight Experiments Program (SSEP) Mission 6 Yankee Clipper payload of experiments to the International Space Station. Dr. Jeff Goldstein, Center Director for the National Center for Earth and Space Science Education (NCESSE), and NASA Principal Investigator on all SSEP experiment payloads, was part of the briefing. Dr. Goldstein provided an overview of SSEP operations, including the breadth and depth of effort put forward at the local level in each of the participating SSEP Mission 6 communities, and provided an overview of the Mission 6 experiments. Also on the briefing was Brian Talbot, from SSEP National Partner CASIS (Center for the Advancement of Science in Space). Orb-3 was lost on launch on October 28, 2014 (see December 8, 2014 blog post). A replacement payload of 17 of 18 Mission 6 experiments, Yankee Clipper II, launched to the International Space Station aboard SpaceX CRS-5 on January 10, 2015, at 4:47 am EST, from Cape Canaveral Air Force Station, FL. This truly stunning 2-month turn-around was due to the remarkable efforts of all Mission 6 student flight teams, their teacher facilitators, NASA, NanoRacks, and NCESSE. Below is the Pre-Flight Science Briefing, which was carried live on NASA TV on October 26.